During his acute January illness, some of his students (among them also Friedrich von Hardenberg (Novalis) took over the required night watches over the patient.
" . . . Schiller has died, a man whose mind erupted quickly and which developed entirely out of itself, and stongly and widely impacted many of us . . . His strength was his enthusiasm, an enthusiasm that carried him along like a wildly raging river that had broken its dams" (Goethe und seine Zeit 172). This news reached Denmark through the Danish poet and Schiller admirer Jens Immanuel Baggesen (1764 - 1826) in Copenhagen who had, during these days, prepared a Schiller celebration; this celebration was turned into a kind of memorial service. Baggesen also extended the ‘Ode to Joy' into a ‘memorial song'. While Schiller stayed in Karlsbad, he also visited Eger, to inspect the house in which Wallenstein had been murdered. After Schiller had revised ‘Don Carlos', new stagings of this work occurred at Erfurt at the end of September and at Weimar at the end of February, 1792. 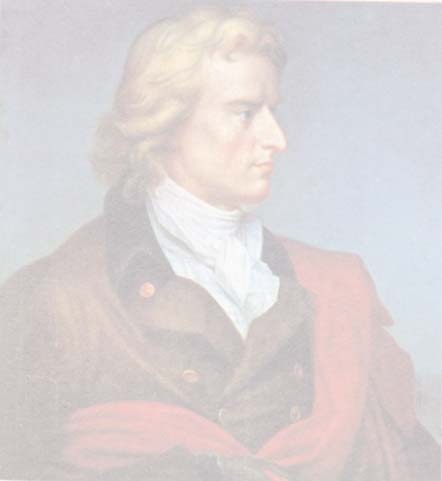 In mid-October, Baggesen was informed of Schiller's actual condition by the philosophy professor Karl Leonhard Reinhold, with the indication that only a fixed income without any work obligation would enable Schiller to recuperate. "At a time in which the after-effects of my illness clouded my soul and left me frightened of a dark, sad future, you reach out your hands to me, through those clouds. The generous offer that you are making me fulfills, nay, even surpasses my most daring wishes. The way in which you are doing this relieves me of the fear that I might prove myself unworthy of your kindness, in that I accept its proof . . . Pure and noble, as you are giving, I consider myself able to take" (Goethe und seine Zeit 173).